I’ve been watching Borussia Dortmund since 2010. Back in those days, Dortmund was the best team in the Bundesliga. They immediately caught my attention for their exciting attacking play and verve. Every game was full of excitement and instantly, the Black and Yellows became my favourite club. Things haven’t been as good as of late, dating as far back as Jurgen Klopp’s final season at the club in which Dortmund finished a mediocre 7th, losing more games than they won and barely qualifying for the Europa League, only by winning the cup final. But under Peter Bosz this season, although they started in fantastic circumstances, they have been a new level of bad and for me, Peter Bosz is a big reason why. This is the worst Borussia Dortmund side I have seen since I began watching the club. Every single year that we’ve lost stellar players, we’ve always replaced them with players who have gone on to do even better. For example, Robert Lewandowski was replaced by Pierre-Emerick Aubameyang, Henrikh Mkhitaryan was replaced by Ousmane Dembele and the most famous example, Shinji Kagawa’s departure to Manchester United in 2012, led to the signing of one of the club’s greatest ever servants, Marco Reus. But that trend has sadly not continued in the same manner for the 2016-17 season. You can forgive Peter Bosz in a way for not knowing the ins and outs of the Bundesliga and also for probably not having as much say as another manager might have in the transfer side of things at the club. But that being said, the signings this season have not been the signal of a club with aspirations to win the Bundesliga title. Instead, they’ve been cheap, inexpensive signings of a Moneyball-styled system in which they’ve gone for value rather than quality. Omer Toprak wasn’t even Bayer Leverkusen’s best defender last season, but he was free, so why not? Jeremy Toljan didn’t even start half of Hoffenheim’s games last season, but he can play several different positions, so why not? Maximillian Philipp, who has been surprisingly good for the club, wasn’t even Freiburg’s top scorer last year, but he was a player they could buy for under 15 million euros, so why not? These aren’t the types of signings that a club with aspirations to win the title would make. They are the types of signings of a club just trying to squeeze into next season’s UEFA Champions League. And on that note, Jeremy Toljan might be the worst player BVB have ever had. The Black and Yellows have only won 2 of the 10 matches that he’s featured in. That’s just trying to be bad. Thomas Tuchel didn’t lose a game at home in the two years he was at the club. He deserved to have more of a say in the transfer happenings at the club and it was ridiculous that he was sacked over something like that after all he did in picking up the mess that Jurgen Klopp left behind. Look at some of the players that Tuchel had a larger say in bringing into the club – Guerreiro and Dembele. Tuchel put his arm around both players and supercharged them into having incredible campaigns. Ousmane Dembele was arguably the club’s Player of the Year last season and did so well that he earned a move to Barcelona. Raphael Guerreiro meanwhile turned out to be the club’s most versatile player and wherever he played, he always came out on top. The former Mainz manager was the first manager to realize that Marcel Schmelzer was defensively unstable, bringing in Guerreiro and even adapting the system to change things around. Tuchel figured out the perfect Dortmund system toward the end of his reign in charge, switching to an Antonio Conte-styled 3-4-3. Playing in a 3-4-3, the Black and Yellows were more fluid than they had arguably ever been. Guerreiro on the left, Durm or Piszczek on the right, three solid centre halves and Dembele and Reus flowing forward at every opportunity. It was the perfect system and the reason why Borussia Dortmund were able to claw their way back into third and win the DFB Pokal once again. This side under Peter Bosz won’t have a shot at winning the DFB Pokal and if they continue on in this kind of form, they won’t even finish third in the league. Peter Bosz can’t be blamed for the lackluster acquisitions in the transfer market. He can’t even be blamed for the losses of fantastic players such as Ousmane Dembele, Matthias Ginter and long-time servant Sven Bender. But he can be blamed for his poor tactics, consistently poor team selections and awful performances in recent weeks. Nuri Sahin has been our best player this season but as soon as Julian Weigl was fit again, he was given the go-ahead to knock Sahin out of the side without anyone even questioning it. Lukasz Piszczek’s injury has been detrimental to BVB. Their poor run of form coincides with the exact moment he became injured. Obviously injuries to players like Raphael Guerreiro, Marco Reus, and Mahmoud Dahoud haven’t helped the club either, but Dortmund are a club always cursed with injuries and other managers have been able to work around it. This current Dortmund side lack spirit, leadership and tactical awareness and Peter Bosz is clearly way over his head in trying to lead them to the top of the table. 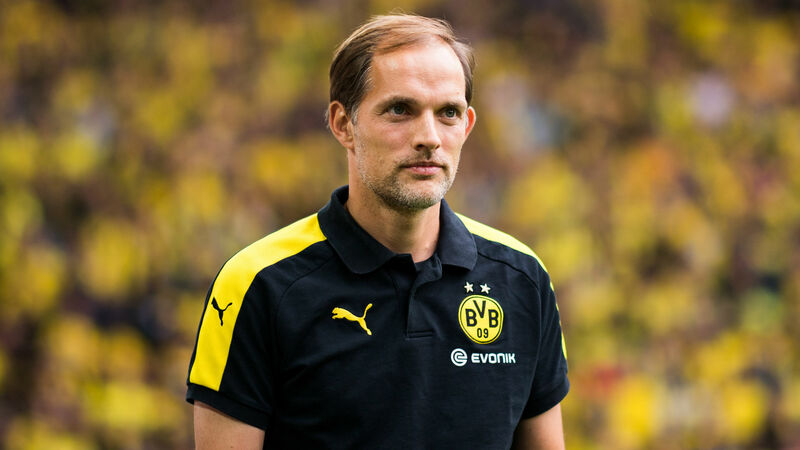 Thomas Tuchel should have never been sacked by the Dortmund board and unfortunately for BVB fans, this might be another season to forget.